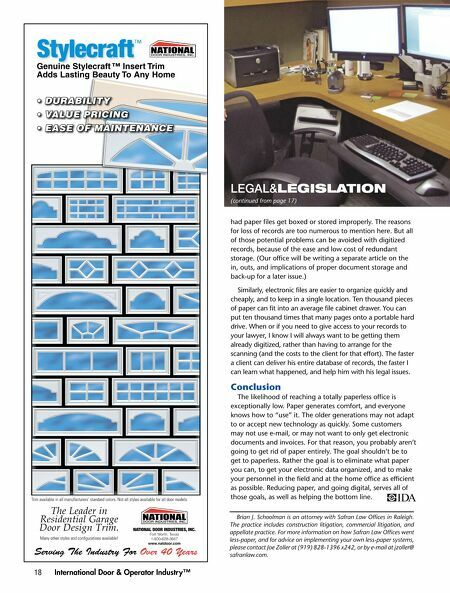 Stylecraft UÊ 1, /9 UÊ6 1 Ê*, UÊ - Ê" Ê / ™ Genuine Stylecraft ™ Insert Trim Adds Lasting Beauty To Any Home LEGAL&LEGISLATION (continued from page 17) had paper fi les get boxed or stored improperly. The reasons for loss of records are too numerous to mention here. But all of those potential problems can be avoided with digitized records, because of the ease and low cost of redundant storage. (Our offi ce will be writing a separate article on the in, outs, and implications of proper document storage and back-up for a later issue.) Similarly, electronic fi les are easier to organize quickly and cheaply, and to keep in a single location. Ten thousand pieces of paper can fi t into an average fi le cabinet drawer. You can put ten thousand times that many pages onto a portable hard drive. When or if you need to give access to your records to your lawyer, I know I will always want to be getting them already digitized, rather than having to arrange for the scanning (and the costs to the client for that effort). The faster a client can deliver his entire database of records, the faster I can learn what happened, and help him with his legal issues. Conclusion Trim available in all manufacturers' standard colors. Not all styles available for all door models. 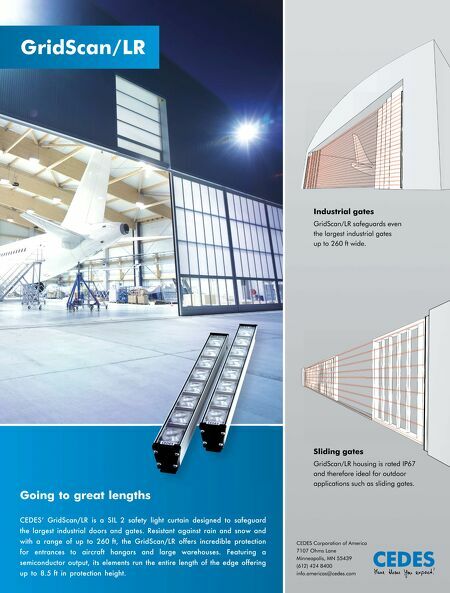 The Leader in Residential Garage Door Design Trim. Many other styles and configurations available! 18 The likelihood of reaching a totally paperless offi ce is exceptionally low. Paper generates comfort, and everyone knows how to "use" it. The older generations may not adapt to or accept new technology as quickly. Some customers may not use e-mail, or may not want to only get electronic documents and invoices. For that reason, you probably aren't going to get rid of paper entirely. The goal shouldn't be to get to paperless. Rather the goal is to eliminate what paper you can, to get your electronic data organized, and to make your personnel in the fi eld and at the home offi ce as effi cient as possible. Reducing paper, and going digital, serves all of those goals, as well as helping the bottom line. NATIONAL DOOR INDUSTRIES, INC. Fort Worth, Texas 1-800-628-3667 www.natdoor.com Serving The Industry For Over 40 Years International Door & Operator Industry™ Brian J. Schoolman is an attorney with Safran Law Offi ces in Raleigh. The practice includes construction litigation, commercial litigation, and appellate practice. For more information on how Safran Law Offi ces went less-paper, and for advice on implementing your own less-paper systems, please contact Joe Zoller at (919) 828-1396 x242, or by e-mail at jzoller@ safranlaw.com.